We had planned to leave on Friday. But it didn’t happen that way. We met up in Warwick after work to get some Mexican food and to run some last pre-trip errands. I was tired too. I had been preparing to be out for the 2 week trip for nearly a month. I made sure that all the tasks that needed to be finished were assigned to appropriate people, and that they knew how to do them. I did the ones I could do before I left. I worked late. So did Todd. On Saturday morning I wrote the list of errands on the bathroom mirror in dry erase marker. Clean car, pack, clean out truck, get drugs from CVS, Todd’s haircut. We packed Todd’s Nissan Rogue for the ride to Vermont. Normally we would do a one way car rental, so we wouldn’t have to leave a car that we’d end up picking up later on. But there weren’t any car rental places willing to rent us an SUV and leave it in the booming metropolis of Rutland, VT. I called all of them; no dice. We relented to Todd not having his car, and we packed it with inches to spare with Todd’s Tetris-like abilities. I swear he could fit an elephant in a barrel. A 4 hour drive ends up to be very long when you stop a lot. We left the truck at New England Yacht Rigging, which is near our home mooring in East Greenwich. We said goodbye to our friends Maggie and Charlie at the shop, and headed north. “Trust me. I am a technology consultant.” I’ve heard Todd say something like that so many times. He says it like doctors on TV do. In the car Todd was logged in and working while I drove. But his Verizon hot spot wasn’t working properly and he decided to stop and get another one at a store in South Hadley, MA. Then we stood in the parking lot for awhile after while he helped a complete stranger configure his Droid. The good karma he racked up in that parking lot paid off and was a great start to what would be one of the most amazing trips we’d ever sailed. 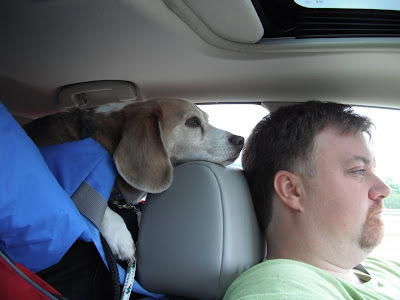 I don't know how we'd get around without the onboard beagle navigation system.